Marvel Two-in-One #5: Seven Against the Empire! After last issue, the unconscious trio of Ben Grimm, Captain America, and Sharon Carter are hauled before the Lord-sire of the Badoon. To find out who they are and where they came from, he orders a memory probe used on Cap, and it pretty much recaps last issue. 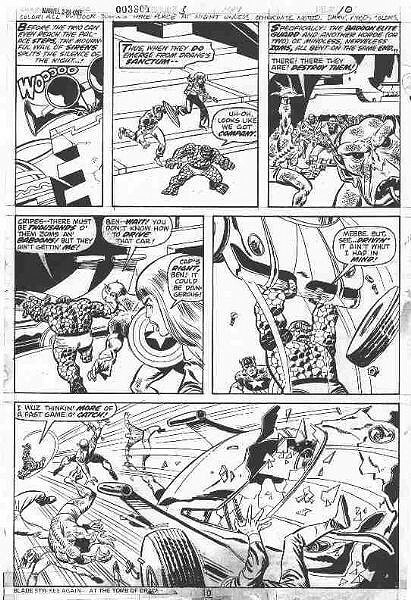 As the flashback comes to an end, Ben wakes up and clobbers the Monster of Badoon into the memory probe, freeing Cap and frying the Monster. Cap, Ben, and Sharon make their escape. Elsewhere, Tarin is trying to convince the resistance to rise up and strike back. They're more than slightly skeptical of her story, until someone rushes in with reports and video of Captain America fighting. The rebels decide to take action, and also send out a call to the Guardians of the Galaxy, who kick in the Harkovian Hyperdrive and head back for earth.. Page 27, panel 5. Captain America: "Right now, our job is to formulate a plan of action!" Ben: "Plan schman! You formulate! Fer me -- It's Clobberin' Time!" Ben also gets to issue his patented battle cry on the front cover. The Thing, Captain America, Sharon Carter, Tarin, the Zoms, the Monster of Badoon, and the future world of 3014 all last appeared in MTIO #4, which directly leads into this issue. The Badoon, Drang, and the Guardians of the Galaxy (Vance Astro, Charlie-27, Martinex, and Yondu) all last appeared in Marvel Super Heroes #18. The Thing next appears in Avengers #127. Captain America and Sharon Carter next appear in Captain America #176. Following this issue, the four Guardians and their ship next appear in Giant-Size Defenders #5, and the Badoon and the world of 3014 (by them 3015) next appear in Defenders #26. Zoms again appear in Defenders #27. Drang does not again appear; nor does this particular Monster of Badoon, but another Monster next appears in X-Men Annual #5. Tarin next appears in Guardians of the Galaxy #17. Zakkor (leader of Earth's underground) appears here and never again; his followers (most unnammed; one is Qarl) all first appear here and may well individually appear again in GotG #17 or later, but there's no real way to know. Similarly Ebor, Ogg, and many other unnamed Baddoon apparently never appear again. The events of MTIO #4 are briefly depicted in a flashback in this issue. The next issue blurb in the letters page identifies Thor as the next guest star, but Thor doesn't actually make it into MTIO until issue 9. The guest star in issue 6, as correctly identified in the blurb on the final page, is Dr. Strange. This is only the second appearance of the Guardians of the Galaxy. They'd previously appeared in a one-shot story in Marvel Super Heroes #18, and would next appear in Giant-Size Defenders #5. Here's a link to some Gerber criticism, if you like. Original art from your editor's collection. Our hero, along with Cap and Sharon Carter, making their way through the NYC of 3014 before the Guardians get involved. You have to love Ben's way with a car!